Most of our staff cannot speak English, so it’s recommended to send e-mail. 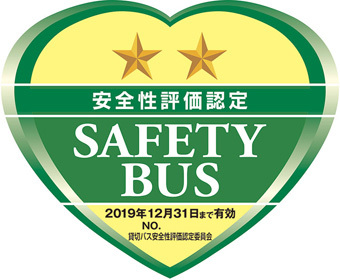 MK Sightseeing Bus is a company that’s earned two stars on 'the chartered bus safety evaluation certification system' established by Nihon Bus Association. We strive to comply with laws and regulations and keep on making daily efforts to protect the safety of passengers. -Company name : MK Sightseeing Bus Co.,Ltd. -We recommend you should make an early reservation since it’s very crowded on weekend and national holiday of tourist season. -The departure or arrival place must be in Osaka or Kyoto, Hyogo prefecture. We offer a variety of buses ranging from large one to small one.You can choose the most suitable bus according to your application and request. We can provide you a small hand-hold device for interpreting, “POCKETALK”and free Wi-fi. Should you have any questions, feel free to contact us here. *Most of our staff cannot speak English, so it’s recommended to send e-mail. *We will receive this form 9:30 am on weekdays. Copyright © 2008-2017 MK BUS Co.,Ltd.